From getting your dupatta dyed the right shade, to buying disposables for those unexpected parties; getting the zipper on your handbag repaired or buying a cell for your old wrist watch; crockery for Dhanteras to the diyas for Diwali, we welcome you to Indira Market in Noida Sector 27, where nothing is ever difficult to find. #LBBTip: There’s a main road, lined with fruit and veggie stalls, which leads you to the maze-like gallis of the market. It’s difficult to pin-point exact locations, so we suggest you ask people around you, and they’ll point you to the right shops. Get all those beautiful paintings and embroidered pictures framed. There are two-three shops on the left side of the market, a little further down the main road, where you can get these done. Fancy Photo Framing is a popular choice here for all your fancy furnishing needs. Forget Chandni Chowk, get all sorts of lace and gotas to go with your dressy Indian wear at Ansari Laces and Zari Shop. They have a mind-boggling collection of buttons as well! Can’t find the exact shade to match that petticoat? Looking for a saree fall? Have a faded dupatta you want to get dyed? Head to Swastik for all your ‘matching’ needs. 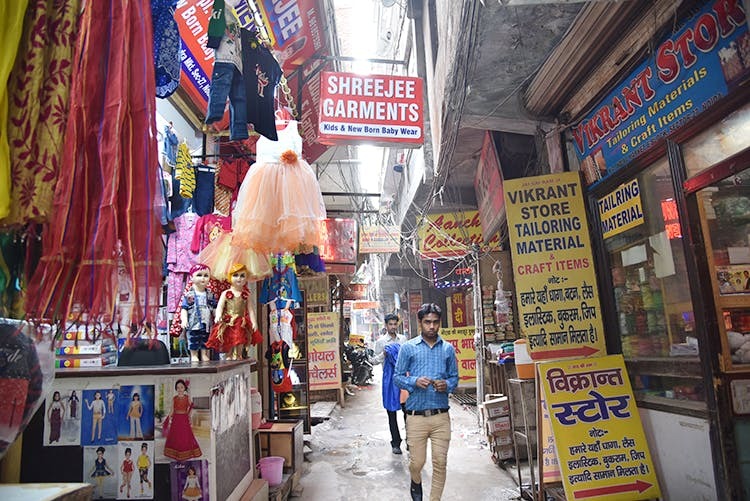 Be it a kurta-pyjama set or an anarkali, there are a variety of tailors here to choose from, but Raj Tailors and Noushad Tailors pretty much reign when it comes to complicated tailoring. On some evenings, there’s a karigar outside Raj Tailors who does intricate embroidery, as per the design of your choice. If you’re a knitter, a DIY-crafter or crocheter, this is a number you need on your speed-dial. Choose from a wide variety of colours and shades at Meenu Wool Store. They keep knitting needles and books on knitting patterns as well. For all your puja-related samagri, from diyas to incense sticks, this shop has been around for ages and stocks all the little knick knacks that your grandma is forever looking for. There’s also an in-house astrologer who reads horoscopes for a nominal charge. A market is incomplete without street food, and Indira Market doesn’t disappoint in that area as well. With momo stalls, mongode stalls, aloo tikki and juice corners, one really is spoilt for choice. This list is a small needle in the large haystack that Indira Market is. There are salons, utensil and crockery shops, earring stalls and more.